A number of restaurants, retailers and other service providers have installed kiosks in their businesses asking for reviews, and hundreds of customers are responding. Phoenix entrepreneur Kevin Berk pivoted his online review system, ServiceGuru, so customers can let a business know how their experience was in the moment it happens. “It’s so fast and easy and right at the time of the experience,” Berk said about the new ServiceGuru kiosks. Berk installed kiosks this spring in Valley locations of Pita Jungle, Subway, Zipps Sports Grill, Ace Hardware, Hyatt Regency Scottsdale and 4C Medical Group. The kiosks offer an Apple Inc. iPad’s that ask customers questions about their service and allows customers to review specific employees with whom they interacted. Berk started a similar review platform three years ago, but it was done online and through an app. 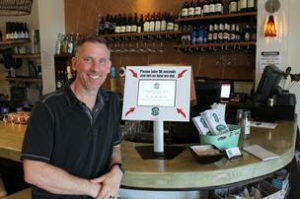 Very few people left reviews, he said, but by bringing kiosks to storefronts, he has seen a large increase in reviews. For example, a Phoenix-area Subway restaurant received 1,400 reviews from customers after three weeks of having a kiosk installed. In less than two months, Zipps received 1,254 reviews, plus 100 employee reviews from customers in its 12 restaurants. By getting more reviews from people right after they ate or shopped at a business, owners are given real-time feedback, allowing management to act fast to resolve negative experiences. Berk said metrics from his kiosks can be used to evaluate employees, but can also be used by employees as part of their resume to show people believe they give good service. “This program allows the associates to see immediately how they are perceived by the customers and they are able to work on their low scores and share in their success,” Velvet Holt, the general manger the Westlake Ace Hardware in Edmond, Oklahoma, said in an email. Berk charges $249 to install the ServiceGuru kiosk and $99 per month for a subscription to the service.